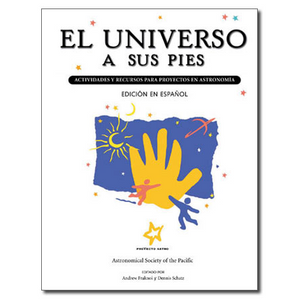 The Universe at Your Fingertips in Spanish! This new collection of over 60 exemplary hands-on activities features the "greatest hits" from Universe at Your Fingertips and More Universe at Your Fingertips, the most popular resource notebook and activity manuals published by Project ASTRO. The activities have been reviewed by a multi-national group of Spanish-speaking educators and astronomers and updated and appended for use in the northern or southern hemisphere. Perfect for the bi-lingual or Spanish classroom or youth group, the 3 hole-punched, loose-leaf pages feature 490 pages on a broad range of astronomical topics. Click here to view the Table of Contents for El Universo a sus pies. This product is a translation of the "greatest hits" from the Universe at Your Fingertips and More Universe at Your Fingertips.